Ayodele Fayose, governor of Ekiti state, lost consciousness momentarily on Wednesday, after policemen reportedly fired teargas in Ado-Ekiti. A combined team of security operatives from DSS and Nigeria Police Force, has laid siege to the Ekiti state government house. Security operatives had dispersed supporters of PDP from a venue of the party’s rally ahead of the governorship election in the state. Party members had converged on the popular Fajuyi Park in Ado Ekiti, on Wednesday before gunshots were reportedly fired into the air. 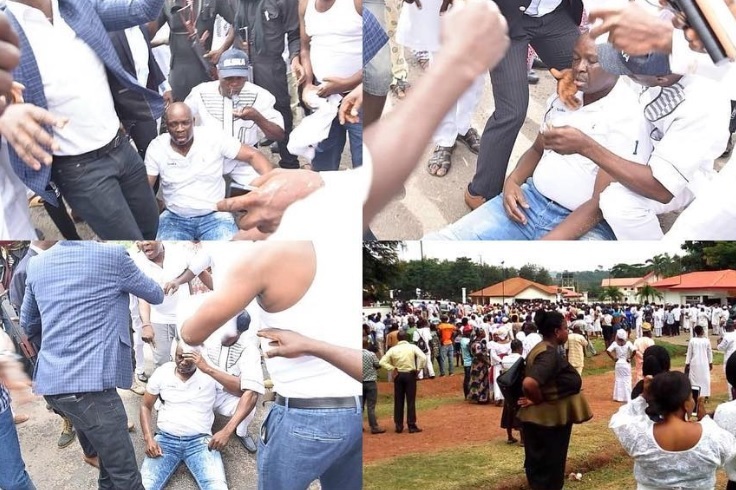 Afterwards, Governor Ayodele Fayose attempted to lead the supporters back to the park but the move was thwarted security operatives who reportedly fired gunshots into the air again. The Deputy Inspector General of Police (DIG) in charge of Operations, Joshak Habila, explained that the move by the law enforcement agents was to prevent a breakdown of law and order in the state.